Grunt match: FPV vs HSV. The Blue Oval has finally challenged its main rival for V8 horsepower bragging rights, but which is better? We asked touring car legend John Bowe to decide. 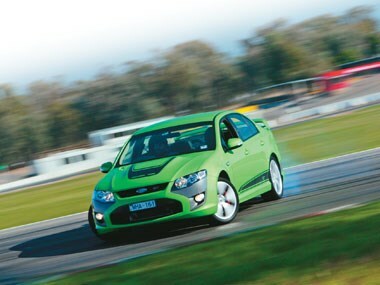 [Jun 2008] John Bowe is stuck between a motoring rock and a hard place and wrestling with the age-old Aussie pub argument: which is better, a Holden or a Ford? 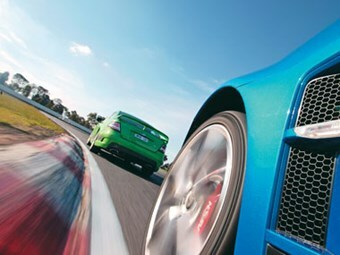 We're at Winton Raceway with the new FPV GT and its ideological opposite, the HSV ClubSport R8, and Unique Cars has asked Bowe to get off the fence and pick which car is better on the racetrack… and he doesn't like it. The fact is, he will be pilloried no matter which car he plumps for. If he nominates the Ford, Holden fans will just say he's biased because he raced Fords for most of his career and had a lot to do with the suspension development of firstly Tickford then Ford Performance Vehicles. If he crowns the Holden Special Vehicle, Ford fans will turn on him and say he has deserted the marque that made his name in touring car racing. So ol' JB is dithering and so am I; you will have to read on to find out what conclusion the champ came to! 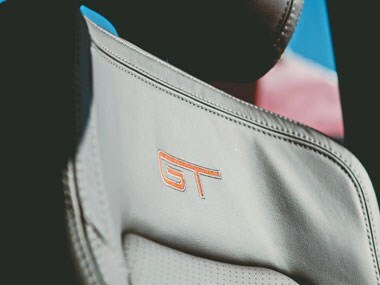 In an age when filling up a V8 car costs a king's ransom, you'd think the GT and ClubSport would be petrol-guzzling pariahs but nothing is further from the truth; people still gladly pay the pump premium (literally) for the buzz of owning and driving either of these high performance family sedan-based icons. 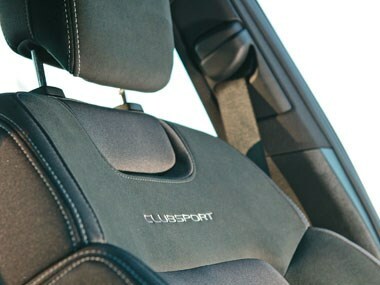 The ClubSport, of course, is the undeniable star in the Oz muscle car firmament and has been since it was first launched. It's HSV's big-selling bread and butter model and the one that underpins the company's bottom line. 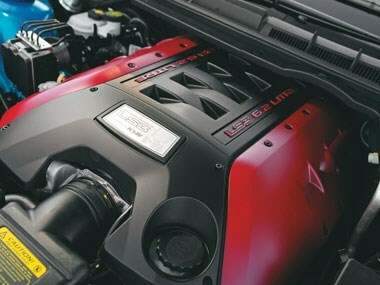 Newly updated with the stonking 317kW/550Nm 6.2-litre LS3 engine, it's the most powerful production HSV to date and offers ballistic performance at a fraction of the cost of a similarly powered European car. After years of avoiding a toe-to-toe power struggle with HSV, new management at FPV has seen the light and waded into the kilowatt war. Its revised 5.4-litre quad cam donk now generates 315kW (up 13kW) and 550Nm, making the battlefield, on paper at least, even. The FPV's re-tuned V8 (it now revs to 6500rpm, up 500 revs) is a huge improvement on its more sluggish forebear. It's also the most powerful car in FPV annals. But despite their obvious basic similarities, these cars offer two entirely different performance and design philosophies. The thing is, though, buyers are unlikely to be swayed from one camp into the other, no matter what mechanical inducements are offered. 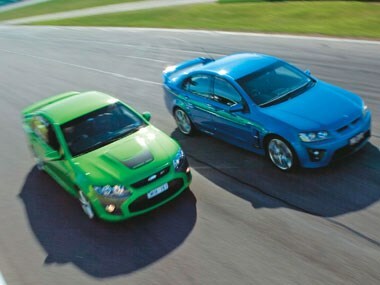 HSV reckons it has never lost a customer to FPV and the reverse is probably true also. The fact is, like the pub argument, you either buy Fords or you buy Holdens. There are few better suspension tuners in the country than Bowe. The recently retired V8 Supercar star was fastidious, even fanatical, about suspension in his racecars to the point that it would keep him awake at night. This writer lives near JB and we often have coffee but during his racing days you'd hardly get a word out of him because he was generally on the phone to his engineers or bashing out long SMS with suggestions to improve the handling of his cars. Obsessed? Damn right. So he's a good bloke to enlist for this exercise, perceived allegiances or not. still a new animal to him but being a total car nut he is keen to see what HSV has come up with. 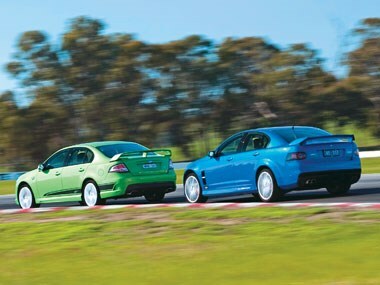 Unfortunately, our track test isn't totally even because FPV has provided an auto GT while HSV has lent us a manual. Although the six-speed ZF auto in the GT is by far a better slush box than the Holden equivalent and a cylinder cut function in the new engine allows quicker more refined shifts, it's still not the ideal for a track test but JB will take that into account. 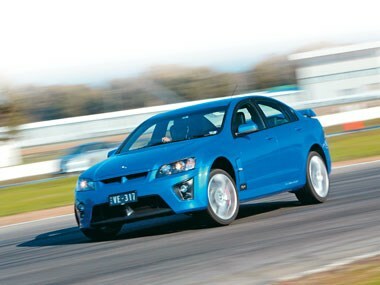 That said, the HSV's notchy, short-throw six-speed Tremec isn't the best manual in the world either. There is another fundamental difference too: the GT rides on 245/35ZR 19 Dunlop Sport Maxx rubber on 19inch rims while the Clubbie gets 245/35R 20 (front) and 275/30R 20 (rear) Bridgestones on 20inch alloys. But each has bags of grip. Bowe gets set to hot lap the ClubSport but first makes a party political announcement. "Whether people believe me or not I am doing this absolutely impartially, even though I am seen as a Ford-head," Bowe says, earnestly. "While I've had a role in the development of every sports Falcon since the EB going back to the Tickford days, I've never been a one-eyed Ford supporter so I'm looking at this totally impartially." Okay, down to business JB. A half a dozen laps later Bowe idles up to the microphone. What did you think? "It's a very nice car," he smiles. "It's easy to drive, it's got very good brakes, it changes direction quite well and it's got a very strong engine that makes a nice induction noise, although the exhaust note is not overly loud. The induction noise is sporty which is a good thing. "Steering feel is very different to the Ford's and because I'm so used to the Ford I didn't like it as much initially but I became used to it quite quickly. It's probably geared differently to the Ford and probably not as quick but it's okay. "The engine has quite different characteristics to the FPV. It's not that it's worse or better, it's just different. It does everything well and it has very good grip. It has wider rear tyres, which I think is good, and the FPV probably should have wider rear tyres too. "Having said that, it's really only on track days that you will notice the extra rear grip because you are driving at the limit. But not everybody takes their cars on racetracks. There's no reason why you couldn't take the ClubSport straight from the showroom to a track and it would go very well. 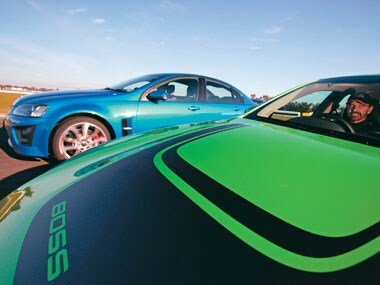 It has a slightly different DNA to the Ford but it's an iconic Aussie muscle car." Bowe drove with electronic driver aids enabled for the first few laps to check how well they work and how much they intrude on driving pleasure then switched them off to have total control over the chassis. "Generally people will drive these cars with stability and traction controls on and so they should," he advises. "When you have this sort of power on tap it's essential to use those devices. The ClubSport has quite a nice progressive ESP (Electronic Stability Program); it works well and controls the rear of the car without killing the pleasure of driving. To their credit it's very well done. Then I did the next few laps with it off allowing the car to be powerslid more. It's a nice car." But is FPV's hero model a better car? "I've driven this car a lot more because I was part of the Prodrive development team and I am very familiar with it," Bowe points out again. "Once again it's very different in every way to the HSV. It's DSC (Dynamic Stability Control) is also very well calibrated and unobtrusive. The steering reacts differently to the Holden to what your hands tell it to do but is not necessarily better than the other. "It handles well, it stops well, it's got great poise but the engine characteristics are quite different. 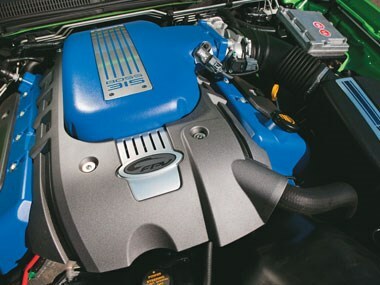 "The FPV has a twin-cam multi-valve engine whereas the HSV is still a pushrod engine but the GT's engine is 800cc smaller in displacement so, while they develop similar power, they do it in different ways. One is not better than the other. "The auto gearbox slightly compromised the car on the track and ideally on the track you'd go for a manual because you select the gear you want exactly when you want it. But I know what the manual 'box feels like in this car." If Bowe has a criticism of the ZF gearbox, it's that it doesn't blip the throttle on down changes, something he has suggested to FPV more than once. It is an obvious omission considering the technology is easily available. "The FPV is slightly more European in its ride and steering feel, it's just the way the dynamics in the chassis work," Bowe continues. "There are two different philosophies in how both companies execute a car. It's like comparing a Mercedes to a BMW, they're both very sporty, quick, grunty motor cars but quite different." When pushed to nominate which Aussie car was more like a Mercedes or a BMW, Bowe would not be drawn. After his hot laps, JB has a bit of fun for photographer Ellen Dewar's Canon, testing each car's drifting capabilities. With 422 and 425hp in the old money, respectively, the GT and ClubSport have no trouble frying the rear tyres in long, smooth powerslides artfully induced by Bowe, who has a grin a mile wide behind his trademark beard. So what did you think JB? "Both cars are very easy to slide - sliding has now become drifting, I gather - and easy to control. Both are forgiving and you can hold them in long slides with the back wheels smoking. Both companies have done a very good job with the suspension. "These cars have come so far, they are world cars. They are so sophisticated compared to a decade ago, the chassis are better, damping is better, engines are better and engine mapping is better. The fact that Australians can buy these cars is pretty special. "Ferrari sells more cars than FPV or HSV so if you buy one of these you're in a pretty exclusive club," says Bowe. "For performance-for-dollar, both cars are hard to beat." And now to the all important envelope. JB, can you announce the winner please? "I don't think there is a winner here. I think they are both enormously competent muscle cars, just very different." So, JB stayed on the fence and everyone is happy. Thanks to Malcolm McNabb and Dunlop for allowing us to share Winton Raceway during their busy testing schedule.